don’t have to be permanent! Our procedure is simple and suitable for all skin types and shades. The treatment is short, lasting no more than 20 minutes, and works by heating the blood inside your dilated vessels. The blood coagulates, collapsing the vessel’s walls and causing your spider veins to disappear entirely. Dermis Advanced Skin Care offers treatment with the innovative Cutera ExcelHR® laser, which has new triple sapphire cooling technology. This makes it the most comfortable vein treatment to date, and we have the ability to treat this condition for all skin types. 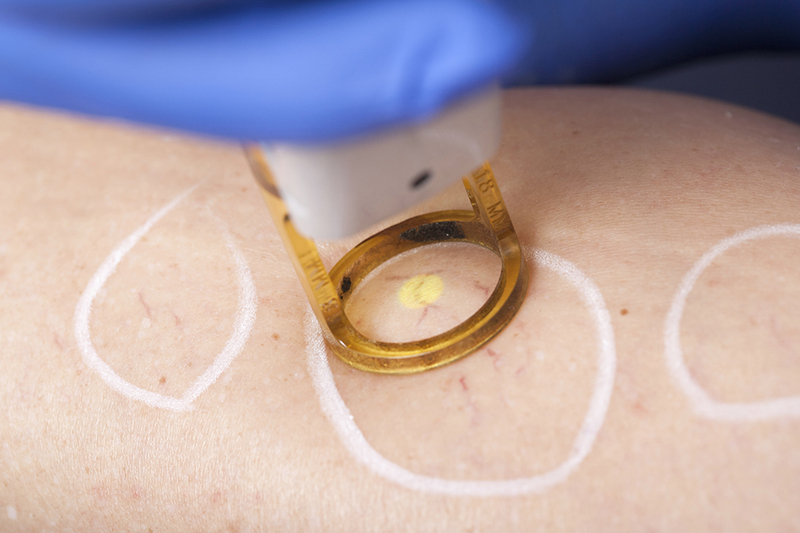 It’s possible you will experience some vessel inflammation after your laser treatment. You should notice some improvement after a few hours, with any inflammation completely disappearing after two to six weeks. After your treatment, you should not expose the treatment area to direct sunlight or to take any medicine containing aspirin. We also recommend our clients use compression stockings or support hosing to help with healing.